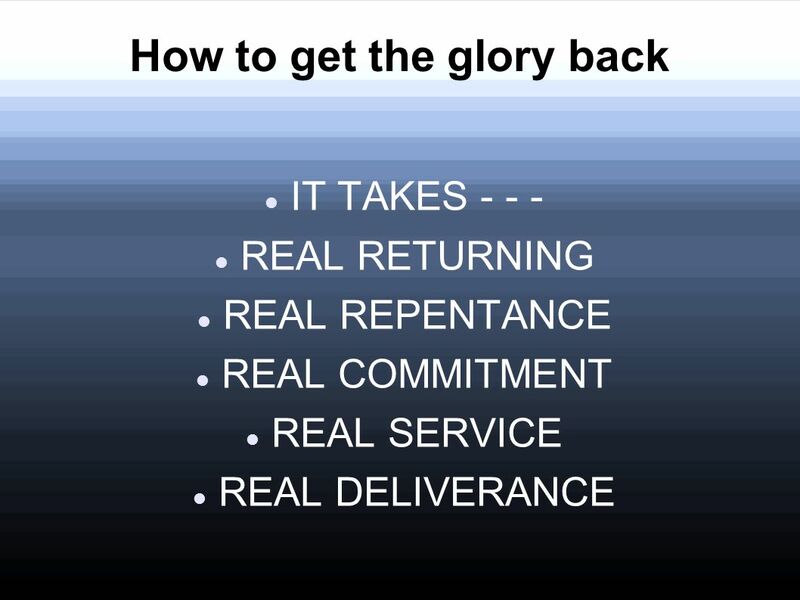 How To Get The Glory Back 1 Samuel 7:1-12. 1 Samuel 7:1-3 1 Then the men of Kirjath Jearim came and took the ark of the Lord, and brought it into the. 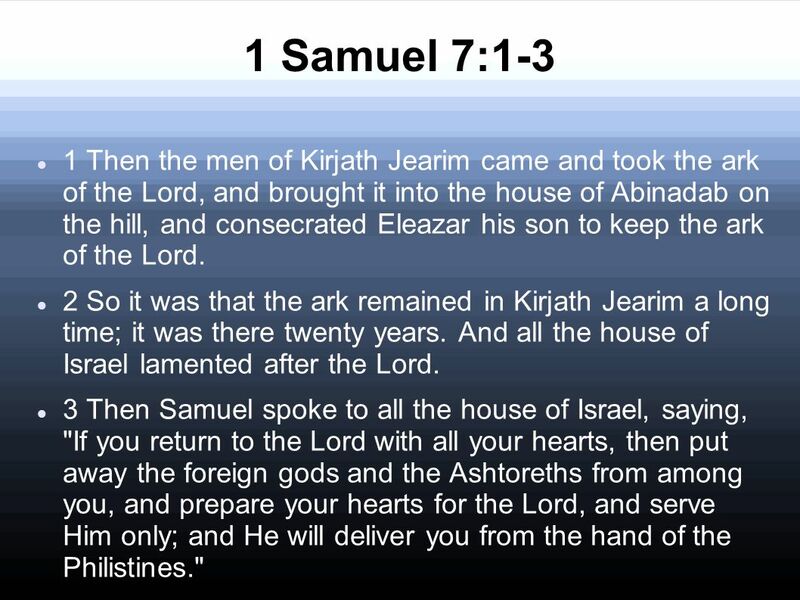 2 1 Samuel 7:1-3 1 Then the men of Kirjath Jearim came and took the ark of the Lord, and brought it into the house of Abinadab on the hill, and consecrated Eleazar his son to keep the ark of the Lord. 2 So it was that the ark remained in Kirjath Jearim a long time; it was there twenty years. And all the house of Israel lamented after the Lord. 3 Then Samuel spoke to all the house of Israel, saying, "If you return to the Lord with all your hearts, then put away the foreign gods and the Ashtoreths from among you, and prepare your hearts for the Lord, and serve Him only; and He will deliver you from the hand of the Philistines." 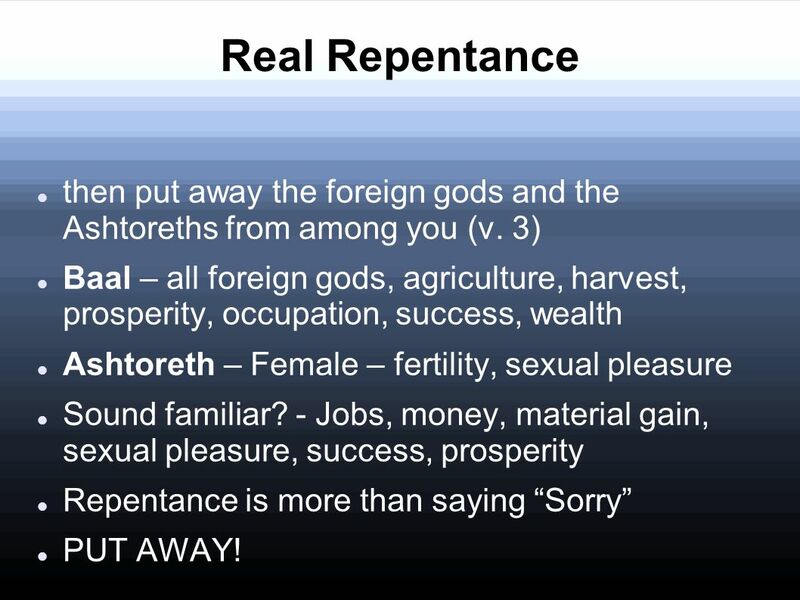 5 Real Repentance then put away the foreign gods and the Ashtoreths from among you (v. 3) Baal – all foreign gods, agriculture, harvest, prosperity, occupation, success, wealth Ashtoreth – Female – fertility, sexual pleasure Sound familiar? 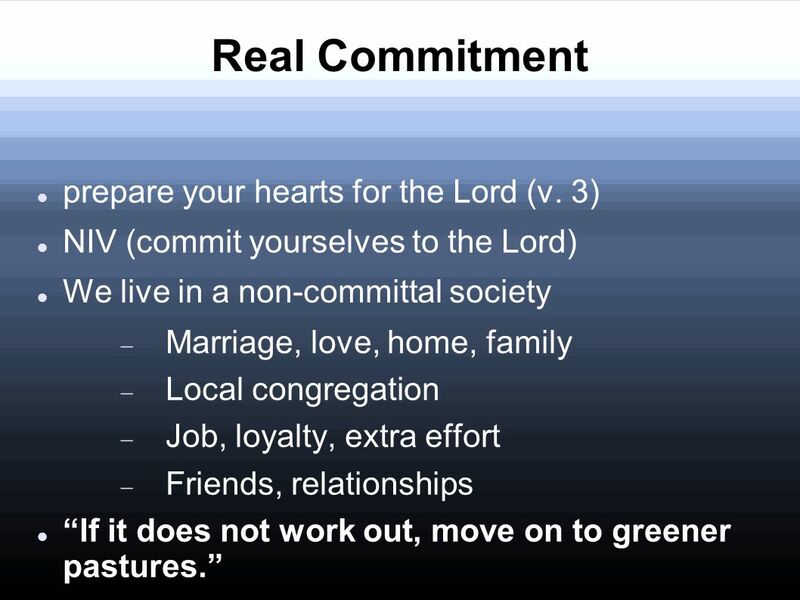 - Jobs, money, material gain, sexual pleasure, success, prosperity Repentance is more than saying “Sorry” PUT AWAY! 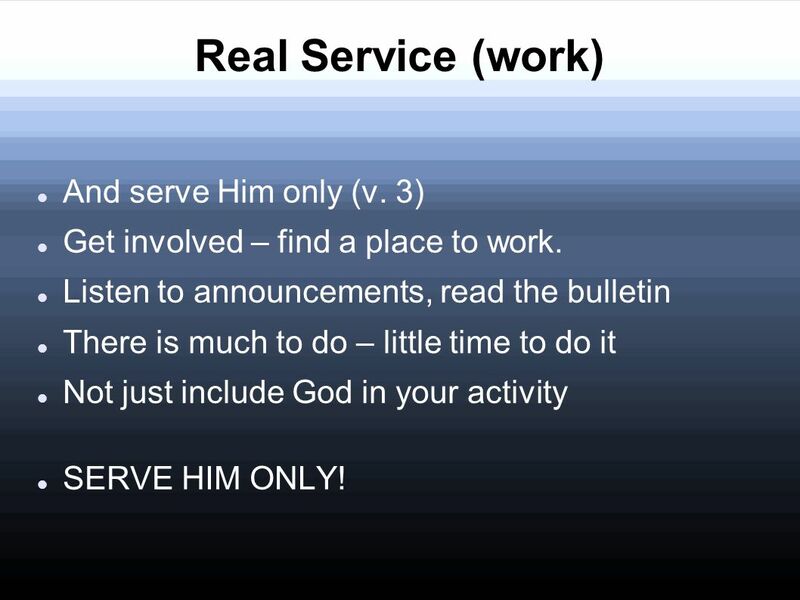 7 Real Service (work) And serve Him only (v. 3) Get involved – find a place to work. Listen to announcements, read the bulletin There is much to do – little time to do it Not just include God in your activity SERVE HIM ONLY! 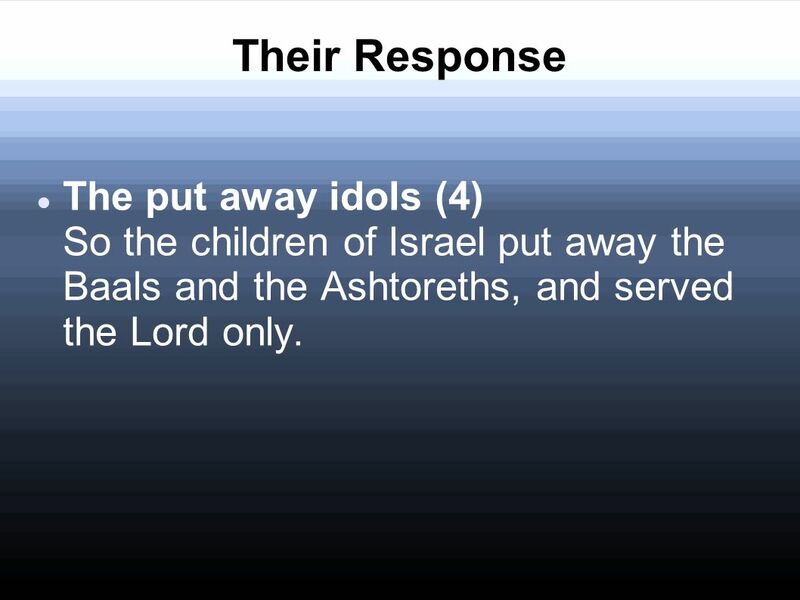 9 Their Response The put away idols (4) So the children of Israel put away the Baals and the Ashtoreths, and served the Lord only. 10 Their Response They confessed their sin (6) So they gathered together at Mizpah, drew water, and poured it out before the Lord. And they fasted that day, and said there, "We have sinned against the Lord." And Samuel judged the children of Israel at Mizpah. 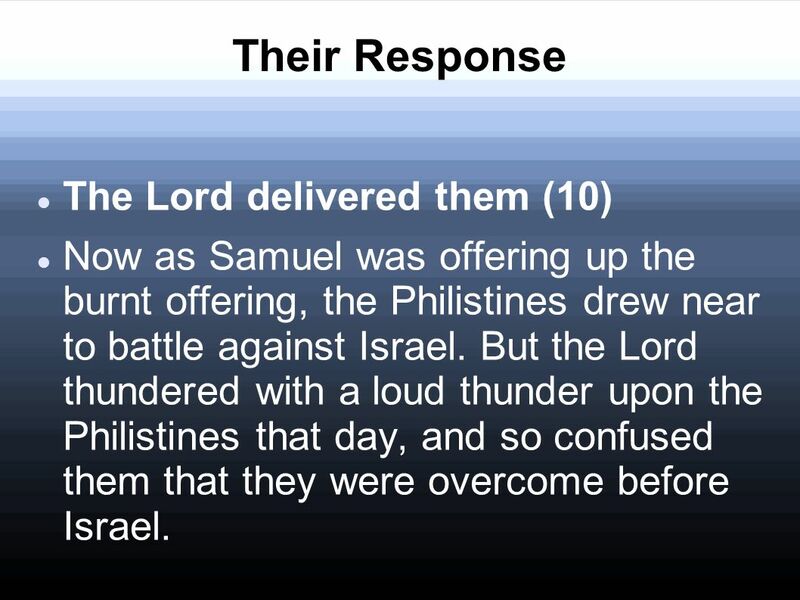 11 Their Response The Lord delivered them (10) Now as Samuel was offering up the burnt offering, the Philistines drew near to battle against Israel. But the Lord thundered with a loud thunder upon the Philistines that day, and so confused them that they were overcome before Israel. 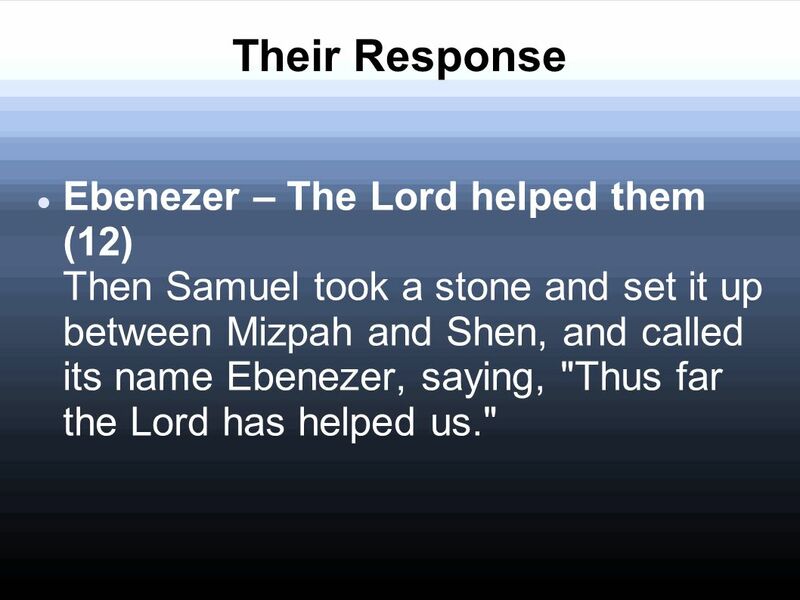 12 Their Response Ebenezer – The Lord helped them (12) Then Samuel took a stone and set it up between Mizpah and Shen, and called its name Ebenezer, saying, "Thus far the Lord has helped us." 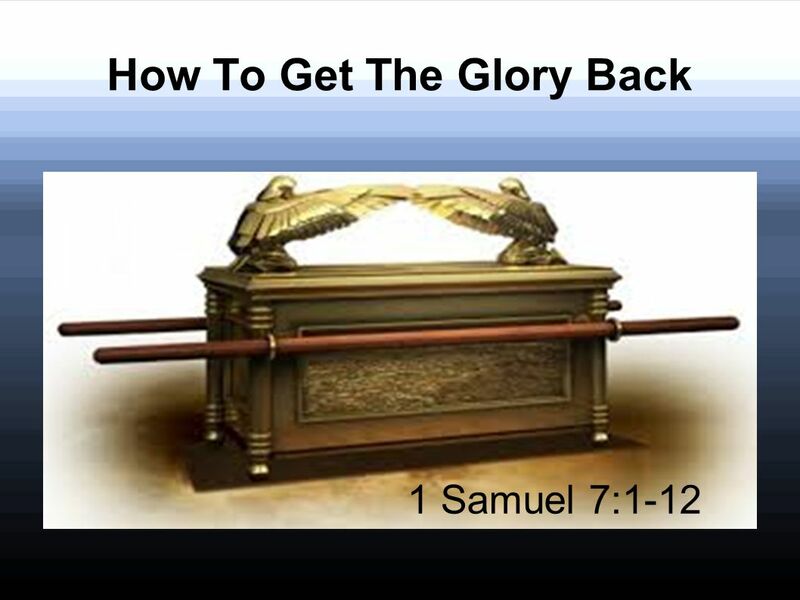 Download ppt "How To Get The Glory Back 1 Samuel 7:1-12. 1 Samuel 7:1-3 1 Then the men of Kirjath Jearim came and took the ark of the Lord, and brought it into the." 1 Samuel Chapters And Samuel's word came to all Israel. Now the Israelites went out to fight against the Philistines. The Israelites camped at. 2 Samuel 5: Samuel 5:17-19 (NIV),17 When the Philistines heard that David had been anointed king over Israel, they went up in full force to search. 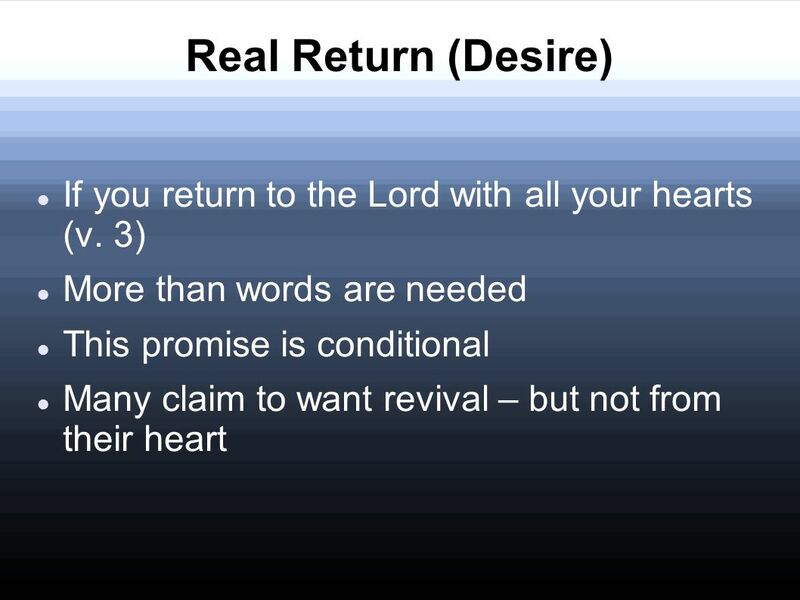 God’s Heart Can Be Broken 1 Samuel 7-8 October 26, 2014. Community Bible Study. Finally, The Land! I.Glorious Conquest II.Gunk Concealed III.Gotcha Covered. Thankfulness 1 Samuel 7. “Gratitude is the memory of the heart.” Jean Massieu. 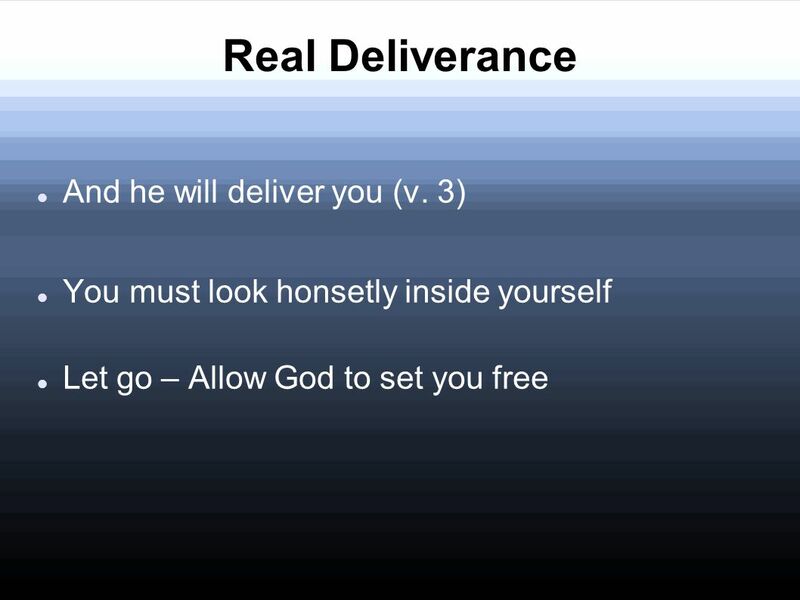 God’s Providence 1 Samuel 7-9. Overview of the Chapters  They repented (1 Samuel 7:2-6). 1 Samuel 7:2-6 1 Sam 8:1-5 1 Sam 9:15-17 Romans 8:28 Matt 25:14-30. Look to the LORD and his strength; seek his face always. Remember the wonders he has done, his miracles, and the judgments he pronounced. I Chronicles. 1st Samuel The Rise and Fall of Saul. 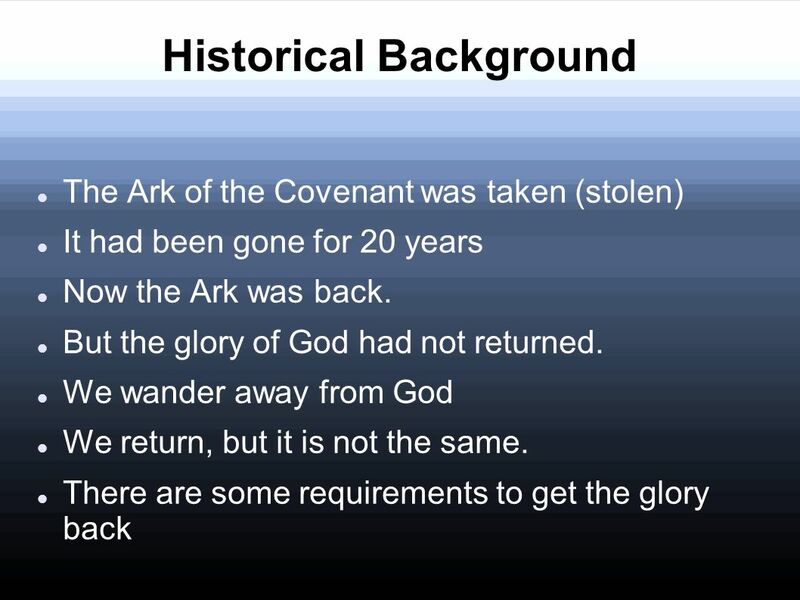 Beginning and End of the Books of Samuel The Song of Hannah (1 Samuel 2:1-11) Note: Promise of anointed king in.